If you've followed the blog for long, you've probably seen me mention Voltaire's Candide a time or two. With this being book week in the blogfest, I would be remiss if I didn't mention my favorite stand-alone novel again now. For those unfamiliar with Voltaire, he was a French Enlightenment philosopher who advocated heavily for civil liberties and social reform in the period leading up to the American and French revolutions. Voltaire had become fast friends with scandal well before Candide was published, and if anyone knew how direly the French system needed reform, he did. In 1725, he was imprisoned in the Bastille without trial for insulting a nobleman. He eventually convinced French authorities to exile him to Great Britain, where he stayed for several years. When he returned to France, he published a series of writings criticizing France's system in favor of Britain's, and once again found himself at the center of controversy. He was forced to flee the nation for a second time. When he returned the third time, he found himself in more trouble. You can guess how that ended. In short, the man was damn good at offended the sensibilities of the stodgy old dudes back in the days of powdered wigs. Voltaire often criticized and philosophized with a razor-sharp wit and sarcastic bite that caused offense and laughter in turns, and Candide was no different. The novel was released amidst great scandal in 1759, and has become one of his most well known works, and for good reason. Through Candide, Voltaire cleverly tore apart optimism (theodicy), and put forth his own philosophical beliefs in a series of fantastical and humorous misadventures for Candide and Pangloss, his tutor. In the novel, Candide grows up in this paradise of perfection where his tutor, Pangloss, teaches him an overreaching sense of optimism (a la Leibniz). When Candide is caught kissing Cunégonde, he is expelled from his little garden of Eden, and impressed into the Prussian army. His experiences there are nothing if not painful: he's beaten, forced into battle, and nearly executed. His sense of optimism is beginning to wane when he escapes and meets an Anabaptist who reinforces the optimistic outlook Pangloss taught him. Eventually, Candide meets up with Pangloss again, and learns that his home has been destroyed and his lady love has been killed. They soon find themselves in a big storm, where the Anabaptist is thrown overboard and drowned. 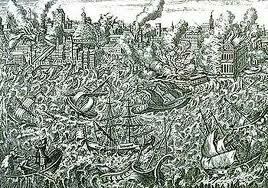 When they reach Lisbon, the city is hit with a devastating earthquake that sparks a tsunami and fire, resulting in the deaths of tens of thousands of people. Despite the crappy situation, Pangloss continues to preach optimism, causing him and Candide to be arrested for heresy and sentenced to death by torture. 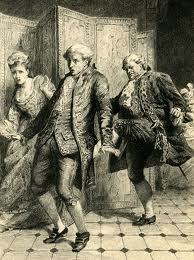 After being flogged, another earthquake hits, and Candide is able to escape. His problems are far from over though. Through the rest of the book, Candide suffers one misadventure after another. He kills his lady love's brother, is almost cooked to death, his lover and tutor are enslaved, etc. With each misadventure his sense of optimism is challenged, but he continues to hang onto what he's been taught the best he can. While the real tragedies interwoven into the novel (the Seven Years War, slavery, the devastating earthquake in Lisbon, etc) are no laughing matter, Voltaire created an incredibly humorous story by combining Candide's ignorant optimism with his sarcasm and the never-ending parade of misadventures he and his friends find themselves in throughout the course of the story. And Voltaire did so primarily to poke fun of Leibniz's Théodicée (in which Leibniz justified the ills of the world by taking the view that the world was the best possible world because it was created by God, who would never choose to create an imperfect world if a better could exist), and those who subscribed to Leibniz's overly optimistic view of evil. In all seriousness, while Voltaire cleverly pointed out the pitfalls of theodicy, he also manages to remind the reader that there are no absolutes and it's a tad silly of us to hold on to a belief or behavior against all reason and evidence to the contrary. A refusal to change accomplishes as much as blind optimism: and that's to say not much of use. 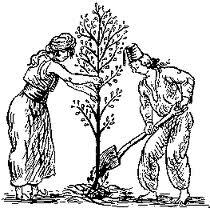 At the same time though, as Candide learns in the story, there is no such thing as a perfect world, and we would be better suited to cultivating our own garden (or worrying about our own lives and how we live them) than we would to constantly concern ourselves with what the rest of the world is up to and why. Sometimes, being master of your own actions, beliefs and behavior just has to be enough. If you haven't read Candide yet, I highly recommend it. You can download a free copy here. I love a post that leads me to a free download~cheers!